How do you solve number 2 on page 28 with the plugging in method? The way to go here is to plug in values to evaluate choices, which makes this a bit of a hybrid between a plugging in question and a backsolving question. Use the answer choices to guide your plugging in. For example, choice A tells us to try x < 0. That turns out to be a good idea. Say x = –2 and y equals, oh, I dunno, 3. That fits the conditions: x < y and –3x > y. Can you come up with any values of x greater than 0 where that would work? No? Well, maybe A is correct, then! But just for the moment, let’s try to eliminate the other choices to reassure ourselves. What about choice B, though? Wouldn’t x = –2 still work if y = –1? Sure would, so we can eliminate that one. Can we plug in values that would eliminate choice C? Sure can! In fact, x = –2 and y = 3, which we just used above when we were considering choice A, show that choice C doesn’t need to be true. Does choice D have to be true? Well, it’s true when x = –2 and y = 3, but what if x = –2 and y = 5 instead? Then x < y would be true, and –3x > y would be true, but (–2)^2 is not greater than 5, so choice D doesn’t need to be true. 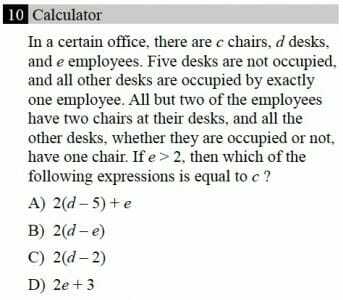 By trying a few quick numbers informed by the answer choices, we can eliminate B, C, and D, leaving only choice A standing. We’re done! While flying from Los Angeles to New york, Pat fell asleep after travelling exactly half of the distance. When she woke up, tge distance remaining was half of the distance she travelled while asleep. For what part of the trip was pat asleep? Let’s work backwards, and use hours instead of distance for ease (assume the plane travels at a constant speed for our purposes). Let’s say when she woke up, she had 1 hour left in her flight. That’s half of the time she was sleeping so she must’ve slept for 2 hours. She first fell asleep halfway through the flight, so she was awake for the first 3 hours, then slept for 2, then was awake for the last 1. She was asleep for 2/6 = 1/3 of the trip. Pilar is a salesperson at car company. Each car costs at least $15,000. For each car she sells, she gets 6% commission of the amount by which selling price exceeds $10,000. If Pilar sells a car at d dollars, which function gives her the commission in dollars on sale? Plugging in might help you think about this in a more concrete way. From what the question says, if Pilar sells a car for $18,000, for example, then we’d expect her to earn commission on $8,000—the amount of the car’s price above $10,000. A 6% commission on $8,000 is . Which of the answer choices, when you plug in $18,000 for d, gives you $480? Choice A is the only one that works. The other way to think through this is to notice that all the choices have the same 0.06 in the beginning, so the 6% part of the problem is taken care of. Our job is to figure out which of the choices has the right thing in the parentheses. Which of those things will provide the amount that d, the selling price, exceeds $10,000? Well, translating the words into math, we’d have to say that “the amount d exceeds $10,000″ can be written as: d – 10,000. Now that you know x, plug 0.5 into each answer choice to see which one gives you 4. Obviously, C must be the answer. Now raise both sides to the –1 power to get a truly alone. Remember that a negative exponent is the same as 1 over the positive exponent, so you can transform the right hand side from to to finish the problem. A triangle’s base was increased by 15%. If its area is increased by 38%, what percent was the height of the triangle increased by? The easiest way to get this question is to plug in! Say the base and height of the original triangle are each 10. The formula for finding the area of a triangle is , where b and h are the base and height, so the area of our original triangle is . If the original height was 10 and the new height is 12, then the height increased by 20%. Hey! I stumbled upon this problem while practicing for the SAT. The boiling point of water at sea level is 212 degrees Fahrenheit. For every increase of 1,000 feet above sea level, the boiling point of water drops approximately 1.84 Fahrenheit. Which of the following equations gives the approximate boiling point B, in Fahrenheit, at h feet above sea level? A) B = 212 – 1.84h B) B = 212 – (0.00184)h C) B = 212h D) B = 1.84(212) – 1,000h Can you please help me? Thank you! One way to make sure you get questions like these right is to plug in some values to see which equation makes sense. For example, you might choose to plug in 0 for h here because you know that at zero feet above sea level the boiling point should be 212° F.
Choices C and D don’t give you 212 when h = 0, so they’re definitely wrong! Now plug in 1000 for h. We should expect the right equation to do what the question says—the boiling point should be (212 – 1.84)° F = 210.16° F. Which remaining choice, A or B, does that when you plug in 1000 for h? Choice A gives you a crazy low number: 212 – 1.84(1000) = –1628. My recommendation, though: plug in. With a little practice you’ll get very fast at it, and then questions like this go from head scratchers to gimmies. In the system of equations above, a is a constant such that 0 <a <1/3. If (x,y) is a solution to the system of equations, what is one possible value of y? The easiest way to go here is to plug in! Let’s say a = 0.1, which is certainly between 0 and 1/3. So there you go—grid in 0.3 as a possible value of y and move along. To see the whole range of possible answers, plug in the endpoints you’re given for a. If a = 0, then the first equation tells us that x = 0, too. If x and a both equal zero, then the second equation becomes 0 + y = 5(0), which of course means y = 0, too! So if a = 0, y = 0, and if a = 1/3, y = 1. That’s why the full range of possible answers is 0 < y < 1. Hi. Would it be possible for you to explain #13 on SAT practice test 5 on calculator inactive (the tea bag problem)? I think the main reason I found it confusing was the wording, and the SAT explanation for the answer was also a little bit wordy. I think plugging in numbers helps here. Say the restaurant wants to make 20 cups of tea one night, so . The equation tells us that they’d use tea bags to make 20 cups of tea. So they needed 22 bags to make 20 cups, and 23 bags to make 21 cups. That’s one extra bag for one extra cup. The other way to think about this is that they’re just giving you a linear equation and asking for the rate of change (i.e., the slope). Think of the equation as . That’s a line with a slope of 1 (and a y-intercept of 2, but we don’t need that for this question). 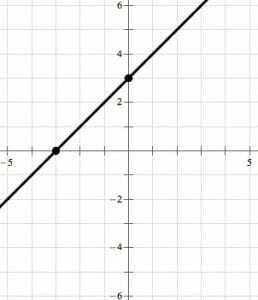 A slope of 1 means for every change in x, you get an equal change in y. In other words, for every change in cups of tea, you get an equal change in tea bags. Do either of those explanations help? If f and g are functions, where f(x) = x^3 -10x^2 +27x – 18 and g(x) = x^3 – x^2 – 6x, which of the following gives a relationship between f and g? Can you solve w/o graphing? 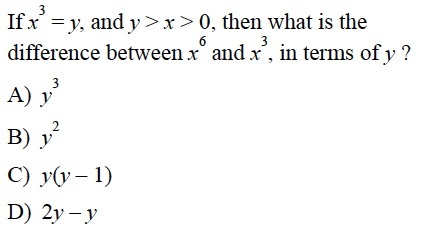 Note that the first term in both functions is , so the relationship isn’t multiplication. Eliminate choice A. Note also that it’s obvious that isn’t just 3 bigger or 3 smaller than , so you can also eliminate choices B and C without any real work. From there, it gets a little tricky. Focus on the constant terms, though. Note that has a –18 in it that goes away in . Note also that when we plug or in for , we’ll have a bunch of binomials to expand, but the only way that –18 goes away is if those binomial expansions spit out a positive 18. Without doing all the math, you should be confident that choice E is the one that will do that. To test it quickly, though, set (since this does need to be true when ). 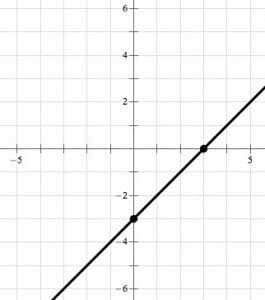 The function f is defined by f(x) is x^4 – 4x^2 + x + 1 for -5 ≤ x ≤ 5. 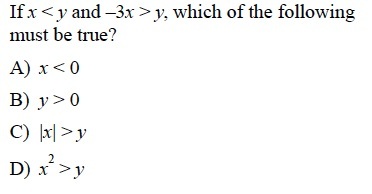 In which of the following intervals does the minimum value of f occur? Yes, but just before beginning I think it’s important to stress HOW USEFUL a graphing calculator is for the math Subject Tests. Anyone who’s prepping for those that doesn’t own one and can’t borrow one from school should find another way to get their hands on one they know how to use for test day. To get this without graphing, you’re going to want to plug in values Just the integers should work. Note that will always be 0 or positive and will always be 0 or negative, but will be both positive and negative, you should start by plugging in negative numbers. From there, you probably see that the minimum is around –1. So plug in a couple more values to see whether you want to choose B or C.
Yeah…gonna want to go with B. With that, you immediately see that the minimum is between –1 and –2. I think the easiest way to get this one is to plug in some numbers. We know that every 4 quarters is a year, so the correct answer will be the one that gives us the same result for 1 year as 4 quarters, 2 years as 8 quarters, 3 years as 12 quarters, etc. If you’re concerned that another one might also work, just check with your calculator! Sure enough, only choice A gives you the same result after 4 quarters that the original equation gives you for 1 year. For question 13 test 1 no calculator, I used plugging in. For question 13 test 1 no calculator, I used plugging in. I made x = 4 and solved to get 42/13. then I plugged 4 into my answer choices and B gave me 42/13. I am curious as to why you did not use plug in for your answer and explanation. Good question. I definitely have this one categorized as plug-innable in my book, but because there’s some algebraic manipulation required whether you plug in or not, I guess I chose to take it as an opportunity to push that skill. Your solution (elaborated below) is also totally valid, and would definitely be my preferred method on a section where calculators were allowed. It might be a stupid question, but on exercise 6 about plugging in, I plugged in 3 for x, and none of the answer choices were correct. Letter c was the closest, but still, 3 raised to 6 equals 729; minus 9 equals 720. okay, but the result for letter c, if y=9, is 72. So, I wanted to ask you if, on this specific exercise, the only option to get the right aswer is plugging in 2 for x.
I think the problem is that you’re squaring x instead of cubing it. If you’re plugging in x = 3, then you should have for y and should be . So you’re looking for an answer choice that equals 702 given y = 27. Choice C works: . Thanks for the question, but I think you mean #10? This one? Let’s go step by step, starting with your choice of 30 for the number of desks. Five desks are not occupied, so you’re correct that there are 25 employees. So far so good. All but two employees have two chairs. So 23 employees have 2 chairs each—46 chairs. Here’s the tricky part: all other desks, whether occupied or not, have one chair. That means the 2 employees that don’t have two chairs plus the 5 empty desks each have a chair at them. So there are 46 + 2 + 5 = 53 chairs. Which expression is equal to 53? Choice D works: 2e + 3 = 2(25) + 3 = 53. Sure thing. The best way to see what’s going on with this one is to plug in. When they tell you that a + b = 0 and a ≠ b, they’re telling you that a and b must be nonzero opposites (i.e., that a = –b and that a ≠ 0). So just pick any nonzero number and rock and roll! That’s a positive slope! Conveniently, finding a positive slope for even one set of values of a and b is enough to eliminate choices B, C, and D: a positive slope is not negative, zero, or undefined! If you’re nervous though, maybe see what happens if you set a = –3 and b = 3 instead. Then your line would go through (–3, 0) and (0, 3). That’s still a positive slope! 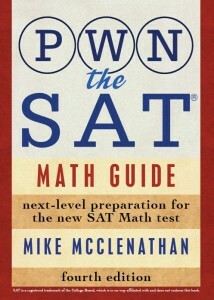 Add webmaster@pwntestprep.com to your address book to ensure delivery. Test 4, section 4, question #27. Why is the answer D instead of C? Please explain this. In the xy-plane, the point (6,3) is the midpoint of the line segment with endpoints (x,5) and (9,y). What is the value of x+y ? “SAT,” “SAT II,” “SAT Reasoning Test,” and “SAT Subject Tests” are registered trademarks of the College Board. “PSAT/NMSQT” is a registered trademark of the College Board and the National Merit Scholarship Corporation. Neither the College Board nor the National Merit Scholarship Corporation are affiliated with this website, and neither endorse it.